Everybody reading this post knows that music and reading are connected from the get go, but here is an article written as a result of a pretty good study involving two groups of high school students that might resonate with people outside of the musical blogosphere. Unlike most of my peers, I came to the world of recorded music late. We had a stereo cabinet in our house, and we did have a few dozen recordings, but the stereo in the cabinet didn't work, and the recordings were all very old. I got a stereo of my own when I was 13 or 14, and I enjoyed listening to recordings a lot, but I enjoyed listening to concerts more. I used recordings mostly for my education rather than for entertainment. When I worked in radio as a young adult my goal was never to program the same piece twice in a six month period. I wanted to give the impression that listening to a recording was an event, and that the radio was a kind of a large concert hall. When I had recordings to review, I would usually listen to them twice, and then would either put them in rotation at the station or bring them home and put them on a shelf. My collection or recordings outgrew shelves. I started taking the CDs out of their boxes and filing them in books. I organized the books by instrumentation and roughly by period. I would occasional listen to recordings again for comparison purposes, or play along with recordings of pieces I was working on in order to get "lessons" from the people who made the recordings. I also had to reference older recordings when writing reviews of newer ones. After I stopped writing for the ARG I was free to file, give away, or throw away as many recordings as I wanted to file, give away, or throw away. I threw away the lousy ones. I gave a few hundred (taken out of their cases and put into loose-leaf books) to my mother, and I filed the rest in loose-leaf books that now fill a small (but wide) bookshelf. The process of filing the CDs took about three weeks. Looking at the recordings reminded me of where I was (perhaps on a walk) when I heard the recording for the first time. I usually remembered the season, the weather, and the route. I usually remembered what I liked about the recording. Perhaps I am still in CD withdrawal, but I haven't even considered opening up the books to listen to a CD. This makes me feel even more excited about playing the Mayer, Bauer, and Bonis concert tomorrow night, because every play through of every piece is a new experience, and having people in the room changes the experience in wonderful ways. I'm off to rehearse . . .
For as long as I can remember, I have begun my scales with C major. When I practice Sevcik, I typically begin in C and add sharps and flats. I have a feeling that lots of people have been doing this for a long time. The word Gamut, as defined by Merriam-Webster, comes from the Greek letter Gamma plus Ut, and seems to be the span between G and C. Perhaps if Merriam and Webster were musicians they would have considered other possibilities. Their etymology doesn't make sense to me, considering the French word for scale is Gamme, and the use of "Ut" as the tonic pitch of a scale goes back at least to Guido D'Arezzo (11th century). The three-language scale books I used to enjoy reading while I played through my scales during my teenage years prompted me to think that the obvious meaning of "Gamut" was a scale that went from Ut to Ut, whatever that "Ut" might be, since "Ut" is the tonic pitch in a "movable Do" system. When the fixed "Do" came about (sometime before the days of Machaut), "Do" became equal to "Ut." Why am I thinking about this? Because I decided today to break the cycle (or circle) and begin my journey through the tonal musical spectrum with G, adding sharps, and then subtracting flats. In other words, I played my scales backwards. The beauty of this is that if you go up and down you don't have to read the music backwards (though you certainly can). What can be gained from this? It forces me to pay more attention to intonation, and it adds variety to my days. Last night Michael and I played love songs for a dinner at a local elder care facility. He captured the moment, and made this card, which I'm sharing here. Happy Valentine's Day everyone! A few days after I finally had the chance to practice exclusively on the violin (rather than on the viola) in order to sound like a violinist for this forthcoming concert above, my instrument decided to develop a crack. Perhaps it was reacting to the extreme changes of temperature and humidity we have been having in the Midwest, or perhaps it was reacting to too much sudden "exercise." In the 20 years I have had the violin, this is its first crack. At any rate, I made the decision to use a different violin for the concert: my Grandfather's violin, which had been sitting unplayed in various family closets for a number of years. I switched my new Larsen strings and Westminster E from my normal violin to it (if you are violinist who has never tried a Westminster E, I advise you to do so right away: it will change your life), and discovered bit by bit that it is a terrific fiddle. Getting to really know a new violin is complicated. You have to instinctively learn the curvature of the bridge, and know what kinds of colors come from which unconscious combination of bow speed and pressure, not to mention the way the instrument responds to the weight and characteristics of different bows. After I made the decision to use this instrument for the concert, I decided to spend about an hour per day playing scales and arpeggios slowly in every key. At 60 beats per minute for each note, there is enough time to pay attention to what by bow arm needs to do in order to keep the bow perpendicular to the string, particularly during string crossings. There is also enough time to pay attention to shifting properly (I'm concentrating on "old finger" shifts these days), and actually thinking of the names of those notes with multiple ledger lines up on the E string. There is enough time to make sure that everything is in tune in every key, and there is time to fix it if it is not. The whole three-octave gamut, as outlined by my friend Hřímalý, takes me about an hour. It is an hour I know my bow has behaved, my vibrato has been free, the sound has been vibrant, and I have made it comfortably from one note to the next through every bit of step-wise and tertian musical terrain. It is always an hour well spent. At 60 b.p.m. there is even time left over to use as a sort of "free brain" state which is a sort of meditative state for me. While I was navigating the key of F# major (again with the F# major! ), for example, I was thinking about the seasonal cyclical nature of these scales and arpeggios, which begin in C major and add flats until no more can be added, and then bloom into sharps, dropping one at a time until the cycle of fifths has come to an end. I was thinking about the bird I heard singing this morning: a steady pitch that seemed to serve as a warning that it may look bright outside, but it is terribly cold. The fact that the birds are singing means that spring will come eventually. They have not been defeated (and there are a good many singing outside my window as I write). I started thinking about the 12 tonalities we have in western music, and the 12 months we have in the year, and then I switched to Kreutzer and started thinking about the violin again. Then I took a break and decided to write this post. The program, you ask? Who are these composers? The German composer Emilie Mayer (1821–1883) wrote six symphonies, several concert overtures, a great deal of vocal music and piano music, and a considerable amount of chamber music (nine violin sonatas, thirteen cello sonatas, eleven piano trios, seven string quartets, three string quintets, and two piano quartets). She studied with Carl Loewe, Adolf Bernhard Marx, and Wilhelm Wieprecht, and worked hard to see that her music was published and performed. Mayer was well respected during her lifetime, and in 1885 she was (posthumously) made an honorary member of the Munich Philharmonic Society. After her death, performances of her music stopped. Most of her music is housed in the Berlin Staatsbibliothek, and remains unplayed. 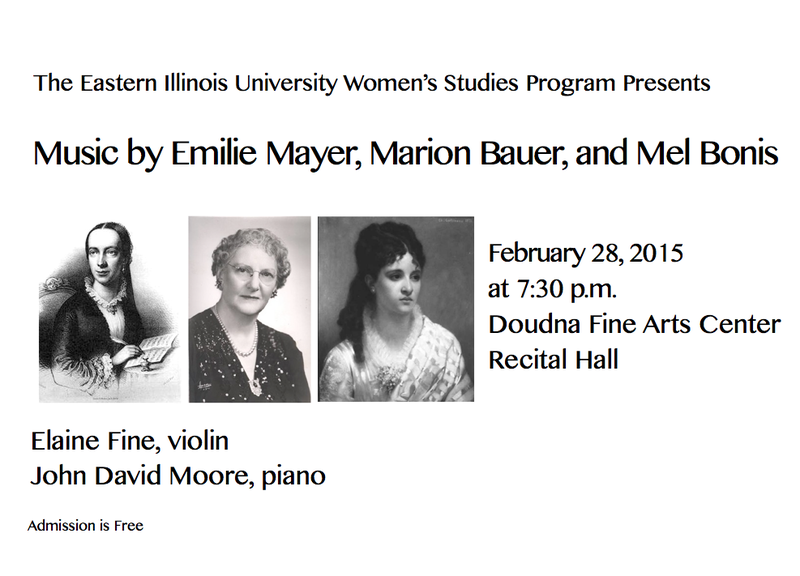 The American composer Marion Bauer (1882–1955) grew up in Walla-Walla, Washington, moved to New York in 1903, and traveled to France, where she traded lessons in English for lessons in composition and analysis with Nadia Boulanger. Bauer was the first of Boulanger’s many American students. When Bauer returned to New York, she helped found the American Music Guild, the American Music Center, and the American Composer’s Alliance. She and Amy Beach were founding members of the Society of American Women Composers. Bauer taught composition, analysis, and music history at New York University from 1926-1951, and she taught at The Juilliard School from 1940-1955. She was a mentor and teacher to Ruth Crawford (Seeger), Aaron Copland, and Milton Babbitt. The French composer Mel (Mélanie) Bonis (1858–1937) entered the Paris Conservatory in 1877. She studied organ with César Franck and harmony with Ernest Guiraud, but her parents made her withdraw because they disapproved of her romance with fellow student Amedee Hettich. In 1883 Bonis’s parents arranged for her to marry Albert Domange, a businessman twenty-two years her senior, and she set music aside in order to raise a family. 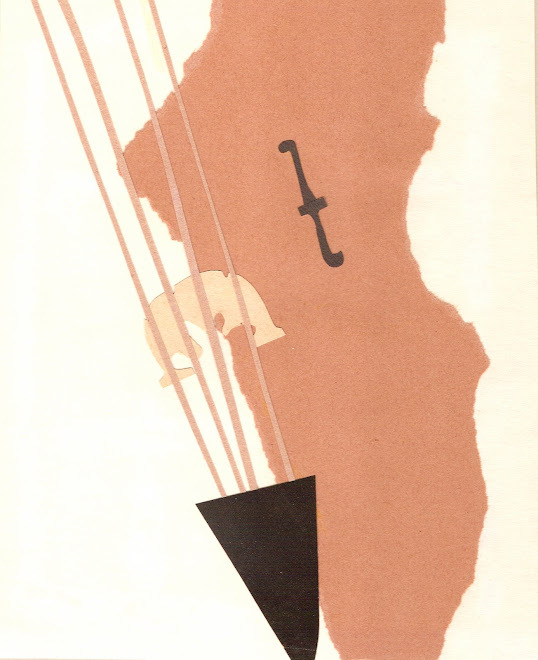 In 1893 she rekindled her relationship with Hettich, who helped introduce her music in the salons of Paris. I just made it through the 13th Prelude and Fugue from Book II of Bach's Well-Tempered Clavier, and I feel like I have been through all kinds of secret doors to leading to secret corners of an uncharted harmonic world. Those six sharps are kind of like a chain of sharp rocks or some barbed-wire fencing, but once you face your fears and make your way in, there are all sorts of harmonic cushions that pull you forward in spite of the double-sharp-filled rough terrain. And then there's the fugue. I have to play it relatively slowly, and I have to be careful of every step, but the journey has rewards and resolutions that boggle my imagination. This wasn't my first time through. My first encounter was this past August, and I found the twists and turns in the piece mirrored much of what I was going through at the time. I dragged myself through determined to get to the other side. This time the journey was different. I found it exhilarating. I gave each of my young students a book of manuscript paper as a holiday gift this year. Hal Leonard sells a cheery one that has a nice plastic spiral binding and a nice notation guide (I also got one for myself, which I use all the time). I didn't give my students assignments involving the manuscript paper, but I told them that if they need manuscript paper to write something of their own, it is there. Yesterday one student presented me with a short piece of music that she wrote using the manuscript paper. She told me that when she got the book she didn't know what to do with it, so she put it on her shelf. Suddenly, as she was practicing, she had an original musical idea, so she got out the manuscript paper and did her best to write it down. She told me that she wrote the first part on one day, and the second part a little later. We spent the first five minutes of her lesson figuring out the key and meter, figuring out what the note values were, and figuring out the articulation (she was extremely particular). Surprisingly it turned out to be four logical measures of 5/4 time in E minor. There were two repetitions of one motive, a new motive, a further statement of the original motive, and a concluding motive. It all made perfect musical sense, and it was entirely original. The process of doing this heightened her awareness of what Handel was doing when he decided to have a dotted quarter note followed by an eighth note rather than two quarter notes. She felt a deeper understanding of what it is that a composer does when s/he writes a piece of music. Although the mindset sounds like it could be from the 1930s (or earlier), the magazine this appeared in was published in the middle of 1999. Invisiblia, one of the newer NPR podcasts, has a fascinating episode that you can listen to or read the transcript from about an extreme case of Mirror-Touch Synesthesia. It occurs to me that development of this extra sensory sensitivity is extremely important for musicians, and it explains a lot about how musicians function. There are people who develop it very early in their lives, and there are people who only develop it when a sensitive teacher shows them how to clue in to the other people who are playing. There are musicians who are highly developed in many ways (perfect pitch, high intellect, excellent memory, multiple degrees) who lack the ability to be physically aware of who they happen to be playing with, and there are absolute beginners who innately understand how to blend and move with the people they are playing with. I developed my musical mirror-touch sensitivity through necessity. Julius Baker, my flute teacher at Juilliard, never used words to describe the physical technique involved in playing the flute. He only demonstrated. And he also taught mostly in a group setting. In order to learn from him I had to imagine what was physically involved in making the kind of sound he made, and I had to intuit his musical choices from studying his physicality when teaching other students. I say that I studied with Julius Baker, but actually I studied Julius Baker. Through my studies I learned to understand the physicality of people I heard play concerts and I learned to understand the physicality of people I played with. I always thought of it as highly developed intuition. When I teach I try my best to spell out exactly what I am doing physically with my instrument(s) and intellectually and emotionally with the music, but it seems that the way most students learn best is through emulating the physicality I demonstrate. I do find that my "training" helps me figure out the way a student is thinking and feeling musically. Through studying Julius Baker I taught myself to study students and figure out what they are doing, how they are feeling, how they are thinking (or not thinking) about the passage they are playing. That's one reason I believe that it is difficult to become a competent musician without having a lot of real contact with other musicians in real space and real time. I have never tried teaching anyone by way of a computer (using Skype or Face Time), but I imagine that the contact might be compromised because of the two-dimensional aspect of the image and the microphone delivery of the sound. Not being in the same room might also compromise the intuitive aspect of the experience. It makes me wonder about computerized instruction altogether. For some things that do not require sensual involvement, computer communication can deliver useful information (I'm thinking about videos that show how to do something or videos that show how something is made), but all of the attempts I have made at learning something by way of a computer have proven unsuccessful. When I told my son, who teaches 6th grade, about my failure with 6th Grade math through the Khan Academy, he suggested that a good teacher could help me through my difficulties. I believe he's right. If I ever find myself in a position where I absolutely need to use numbers in a functional way, I will seek out a teacher who might be able to use intuition to help me with my deficiencies. I tried to learn Spanish through Duo-lingo (another free resource on the computer), and though I passed through levels and levels with flying colors, I remember nada. I learned to communicate effectively in German in a matter of months when I lived in Austria. Note: Since I have never taught a lesson via computer, I would be interesting in trying for the sake of the experience. Send me an e-mail message, and we can see what works and what doesn't (we could do violin, viola, recorder, or flute). Maybe I can write about it. I started this blog on February 7, 2005. As I look back at 2005, I feel proud of the way I started, and as I look back at the 2006 posts I have made through the decade, I'm proud of the way I have continued. I wanted this blog to be a commercial-free space, and it has remained one. I wanted this blog to serve as a resource for people curious about specific aspects of music, and it has been. I'm pretty lousy about doing the kind of "business" that composers need to do in order for musicians to become familiar with their music, but people have become familiar with the music I have written through this blog and through my Thematic Catalog blog, which I started in June of 2006. Since beginning this blog I have become less of a luddite. I now have an iPod, even though I announced that I was not a "pod person" several years back. I participate in Facebook occasionally, even though I never thought I would (I even considered Facebook the enemy of bloggery). I'm even sharing this post there. I love the idea of sharing information, observations, and commentary without having "strings" attached (editors and money being the longest and strongest), and I plan to continue participating in my corner of the musical blogosphere as long as I am able. Thank you to all my readers unknown and known, and a big thanks to Michael, who serves as an inspiration for all bloggers, near and far. 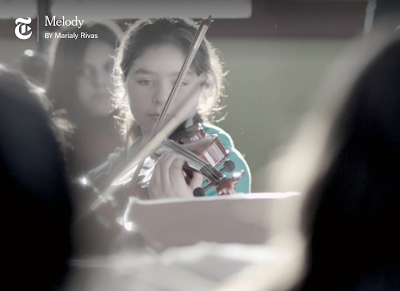 The New York Times has a wonderful article and video by Melody Rivas about youth orchestras in Chile. When I was growing up I used to enjoy reading the music reviews in the Boston Globe and the Berkshire Eagle, particularly when I had been at the concert. Michael Steinberg's reviews were particularly interesting to read. I used to talk with him at Tanglewood (he was a brilliant man), and I used to think that it might be fun to write reviews when I grew up. I came across an issue of the American Record Guide in November of 1992. I wrote a letter to the editor in response to a piece he wrote about the uselessness of baroque period instruments, and he answered by telling me that it was "too bad I couldn't write for them." My response was to ask why I couldn't. A week later a box of CDs arrived along with a style sheet, and I began writing CD reviews. I used many of the CDs that the ARG sent to build a CD library for the radio station I worked at. I was able to learn a great deal through reviewing, but after around 20 years it became more of a burden than a pleasure, and the last year or so it was all burden. I am pleased to announce that the March/April issue will be the last issue that will have any of my writing in it, and I am free to listen to music without feeling the need (or the duty) to make some sort of statement about it. It is a great feeling of freedom. The other day a friend forwarded me a letter from a music critic essentially apologizing to a musician for the way he (the music critic) essentially bashed the musician's playing twenty years earlier. Negative reviews weigh heavily on a reviewer's conscience. The negative reviews I have written over the past 22 years weigh heavily on mine. Once I labeled a recording "not worth reviewing," an option that ARG reviewers were given, and then, because the person who made the recording was a prominent person in music, I wrote a couple of harsh sentences to substantiate my reasons for not choosing to review the recording. The editor of the magazine decided that my nasty sentences constituted a spicy review, so he published them. I should have stopped writing for the magazine then and there, but the damage was already done. I blamed myself, and wrote a letter of apology to the person who made the recording. I never got a reply. I imagine that person is still hurt by what I did not intend for publication. I imagine that person still hates me. It's a heavy burden to bear. Once the magazine sent me a recording made by a former teacher, and the recording was not very good. I did not want to say anything negative in print about one of my teachers, so I chose not to review the recording. That teacher contacted the magazine to inquire why no review was published in the magazine, and then called me. I had to lie and say something about a conflict of interest in order not to hurt that teacher's feelings. Now I can listen to music without having to come up with something to write about it. Not writing about a recording means that I can relate far more personally to the music I hear. I much prefer to hear music live anyway. Even more, I prefer to play it. My math progress has come to a standstill. I find myself making all kinds of mistakes in multiplication and division, and sometimes I simply write the wrong numbers down. I keep getting stuck on the same kinds of problems, and I keep making the same kinds of mistakes. I have been diligent and disciplined (the Khan academy gives you all sorts of badges as rewards for diligence), but I seem to be stuck in the same math rut that I found myself in during the sixth grade. How I passed sixth grade math is a mystery to me. Math IS interesting. If it weren't for the arithmetic, I would probably be going great guns, but I'm not. The more I try to "master" certain skills, the more unsure I become, and the more mistakes I make. I have finally come to the conclusion that I am simply not "wired" for arithmetic. When I was a teenager I just thought I was inept and therefore dumb, but I have learned that I am one of a select group of people who, despite other measures of intelligence and achievement, have serious difficulty with numbers. I liken it to being color blind, tone deaf, or too short to reach a high shelf. There are indeed people for whom music is simply sound. There are people who are unable to match pitches with their voices. Math ability is a talent. Perhaps it is even a gift. This will be the last you hear from me about math, either pro or con. It's time to practice the violin.